BEIJING, Oct. 25, Premier Li Keqiang on Thursday called on China and Japan to work together to build more mature, steady and progressive bilateral ties. 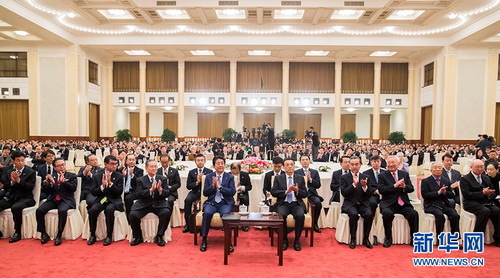 Li's remarks came as he delivered a speech at a reception marking the 40th anniversary of the signing of the China-Japan Treaty of Peace and Friendship together with visiting Japanese Prime Minister Shinzo Abe at the Great Hall of the People in Beijing. "The China-Japan relationship has gone through wind and rain in the past four decades, yet peace, friendship and cooperation have always been the mainstream," Li said. "The elder generation of leaders of both countries showed great foresight and made a correct assessment of the situation 40 years ago to sign the treaty, which was another milestone in the history of bilateral ties following the normalization of relations between China and Japan in 1972. "The treaty established a general direction of peaceful coexistence and lasting friendship between China and Japan in the form of law and affirmed all principles in the 1972 Sino-Japanese Joint Statement. "The four political documents between China and Japan, including the treaty, laid a political and legal foundation for China-Japan ties and became the basic guiding principles for the healthy development of bilateral ties that should be firmly borne in mind. "On the occasion of the 40th anniversary of the treaty, we need adhere to the general direction of peace, friendship and cooperation and conform to the trend of the times so as to jointly build a more mature, steady and progressive China-Japan ties." This year also marks the 40th anniversary of China's reform and opening-up. "China will unswervingly continue its reform and opening-up. China's greater-scale opening-up to the world has provided broad space for higher-level cooperation between China and Japan," Li said. "We welcome Japan to take more active participation in the new round of China's reform and opening-up and continue win-win cooperation." Noting that regional and international situation was undergoing complicated and profound changes, Li said China-Japan ties were back on track and gaining positive momentum, producing not only huge cooperation potential and opportunities, but also difficulties and challenges. Li called on both sides to make concerted efforts in advancing bilateral ties to steadily forge ahead. "The two sides need to understand each other and foster their strategic positioning in a right way," Li said. "The consensus that China and Japan are partners rather than mutual threats should be better implemented in concrete actions." "The two countries need to manage differences and problems constructively on the basis of the principles set in the four political documents between China and Japan and in the spirit of 'taking history as a mirror and facing to the future,'" said Li. The Chinese premier called on the two sides to push forward pragmatic cooperation by tapping complementary advantages, encouraging innovation, and exploring third-party markets to upgrade the quality and efficiency of cooperation. Japan is encouraged to participate in construction associated with the Belt and Road Initiative, Li said. He also reiterated the importance of people-to-people exchanges, especially among the young. He called for more cultural, sports, and local cooperation in the hope of translating the friendship between Chinese and Japanese people into a social basis for bilateral ties. Li voiced his hope that both sides would remain true to their original aspiration in pursing peace, friendship and cooperation in order to usher in a bright future of bilateral ties. Abe said the treaty reaffirmed important principles guiding the development of bilateral relations. "China has scored remarkable achievements since its reform and opening-up, while Japan also stepped forward alongside China," Abe said. Saying that Japan and China played "an irreplaceable role" in the world's economic progress, the Japanese prime minister encouraged both sides to jointly contribute to the continuous development of bilateral cooperation and the world's peace and prosperity. Li and Abe also took a group photo with some of the people who witnessed the signing of the treaty 40 years ago and their families, and visited a photo exhibition on economic and trade cooperation between China and Japan. Abe arrived in Beijing Thursday afternoon for a three-day official visit. It is the first official visit by a Japanese prime minister in seven years.